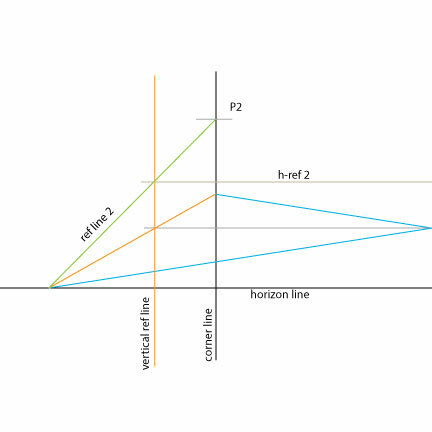 As I mentioned in the first Perspective Hacks, there are two kinds of external vanishing points, diagonal and rotated. Diagonal VPs help to establish proportional apparent distances receding in space, like a tiled floor or the ties of a railroad track. 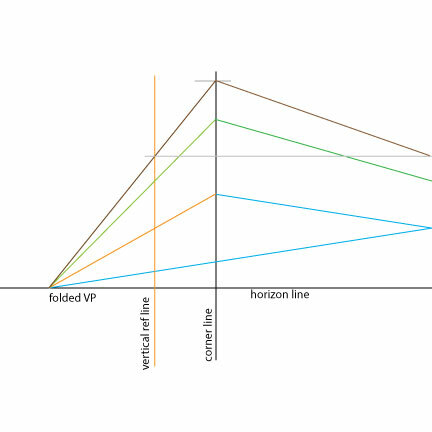 Rotated VPs are used for lines or planes that are set at an angle to the viewer. 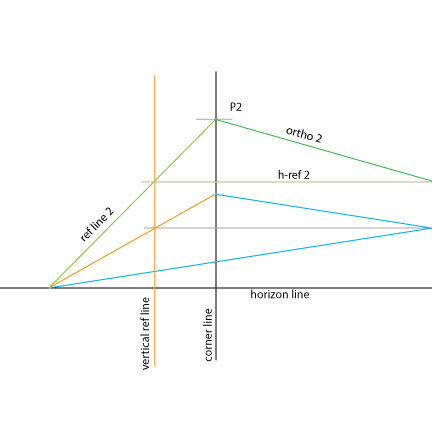 Single point or central perspective works for lines and planes that are parallel or perpendicular to the viewer; parallel lines are shown as straight and parallel to each other, and perpendicular lines converge on the central vanishing point. When a rectilinear object is at any other angle, the corner and at least two sides become visible, requiring two vanishing points. In many cases, one or both of these points will be located very far outside the picture, creating logistical problems setting them up and using them as references. Here is one possible solution, which can "fold" a vanishing point back so it fits inside your picture, or at least onto a reasonable sized drawing board. 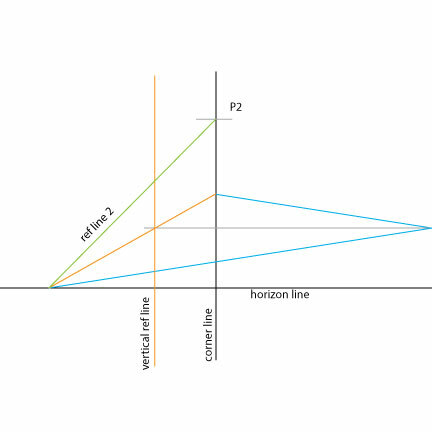 Choose a point "p1" on the vertical corner line. 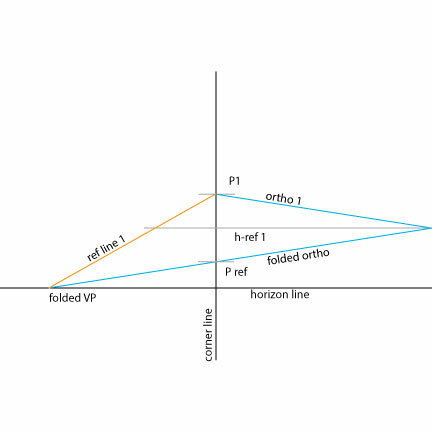 Draw an initial diagonal "ortho 1", carried out to the edge of the paper. This can be based on sight, memory, measurement or imagination. It points to the location of our actual VP, somewhere off the paper. 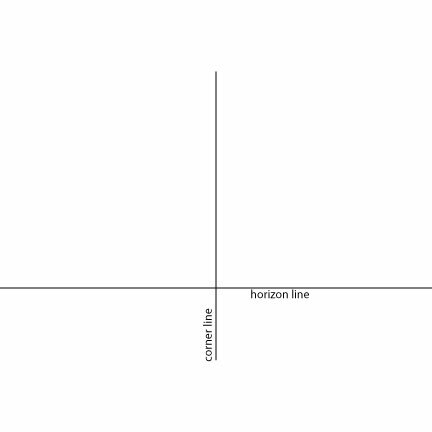 Draw a horizontal line, "h-ref 1," from the point where the diagonal intersects the edge, so as to intersect the corner line and go a bit beyond it. 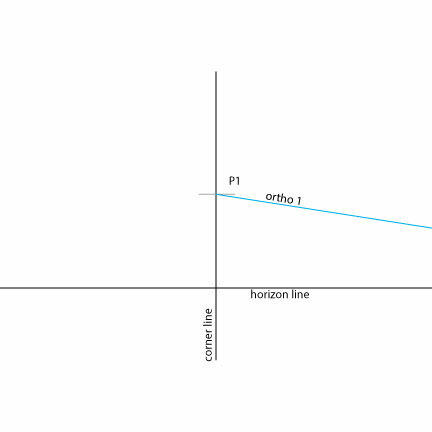 Measure the distance from this intersection to the ortho 1 intersection, "h1"
Mark a point "P ref" on the corner line at an equal distance "h2" below the intersection of h-ref 1. 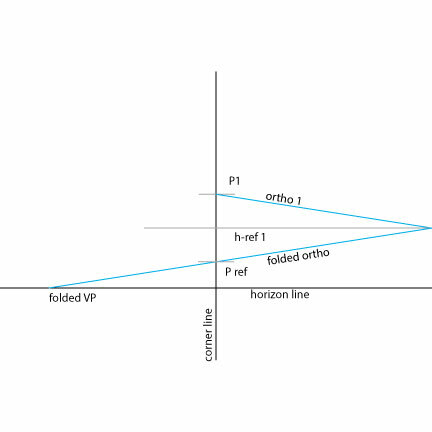 Draw a line "folded ortho" from the intersection of ortho 1 with the edge of the paper through this mark and down to the horizon line. This line creates an angle equal to the original diagonal, but reversed. 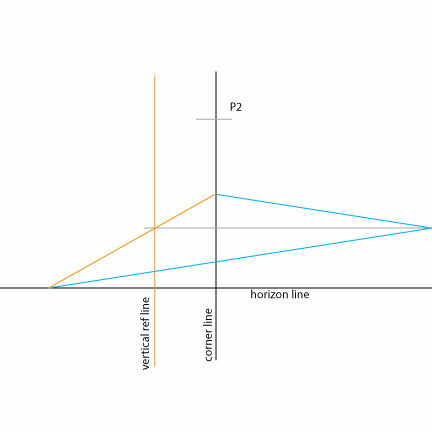 The point where it intersects the horizon is the “folded vanishing point". It is the equivalent of setting a vanishing point outside of the picture, then folding it over to meet a point inside the picture. 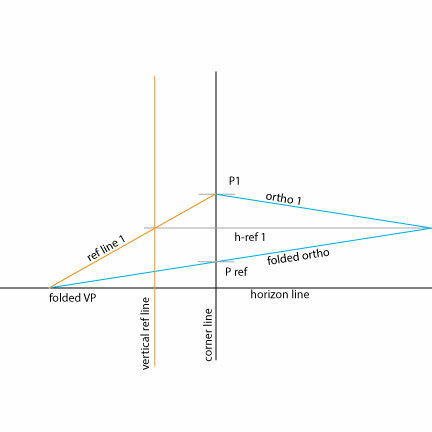 Draw "ref line 1" from the folded VP up to the intersection of ortho 1 and the corner line. Note where it intersects h-ref 1. Draw a vertical reference line intersecting this point. This completes the basic set up. You can now use the folded vanishing point and vertical ref line to draw new orthogonals in the same vertical plane as the first. To create a new orthogonal based on the folded VP, first mark a new point "P2" on the corner line. 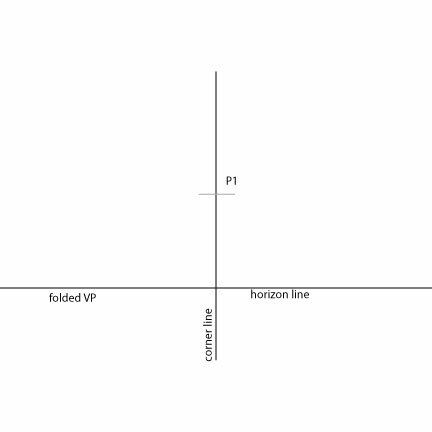 Draw a line "ref line 2" from the folded VP to P2. Where this line intersects the vertical ref line, draw a horizontal line, "h-ref 2" to the edge. 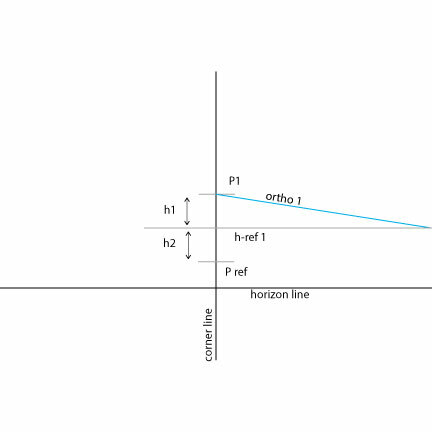 Draw a line from P2 to the intersection of h-ref 2 with the edge of the paper. This line, if carried out off the paper far enough, would intersect the actual VP at the horizon. Repeat this process to create more orthogonals as needed. How to do "two point perspective" without any points!